Some of them are already established and looking to build on what they have achieved so far. Others are just waiting for their chance to shine. 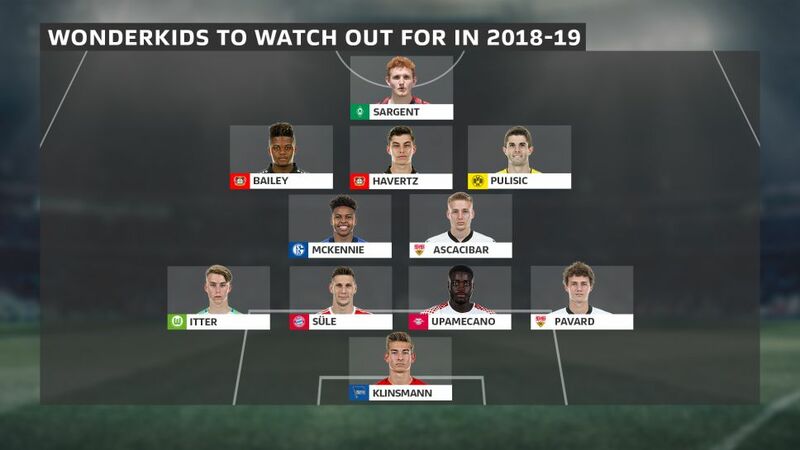 bundesliga.com takes a look at the wonderkids who could add to their reputation in the new season. The son of footballing royalty in the shape of former Germany striker and USA manager Jürgen, Klinsmann junior began making a name for himself in Europe during the 2017/18 campaign. The U.S. youth international joined up with Hertha in July of last year, and made a memorable debut for the club in December. Put between the posts for a UEFA Europa League tie against Swedish side Östersunds, Klinsmann made sure he wouldn’t taste defeat in his first game by keeping out an 87th-minute penalty in a 1-1 draw in Berlin. Hertha boss Pal Dardai gave Klinsmann an A for his performance in that game, but the 21-year-old didn’t feature again for the remainder of the term. The talented netminder has now had time to adapt after spending much of his life in California, and he will be keen to push Rune Jarstein and Thomas Kraft for more game time in the new season. Pavard played every minute in the league for Stuttgart last season, looking like a Bundesliga veteran even though it was only his first season in the top flight. As a result, the 22-year-old caught the eye of France manager Didier Deschamps and - after making his senior international debut in November 2017 - he made the right-back spot his own as an integral part of Les Bleus' victorious World Cup campaign in Russia. By making the switch from playing in central defence with his club to full-back with France, the Lille academy graduate has already been compared to his legendary compatriot Lilian Thuram. Thuram earned a record 142 caps for his country – as well as starting for Monaco, Parma, Juventus and Barcelona – so Pavard is understandably flattered to be talked about in the same breath. Another Frenchman who shone last season, Upamecano could well be the next player whose performances in the Bundesliga see him being selected by Les Bleus. The U21 international’s first full season with Leipzig was a resounding success, as he featured 28 times in the league and also clocked up 11 appearances in European competition. The classy centre-back was nominated for the Bundesliga Team of the Season for 2017/18, and will now look to push on again. Germany’s early exit from the World Cup means Süle is now concentrating on his second season at Bayern Munich. The first went rather well, as his own form and injuries elsewhere meant the former Hoffenheim stalwart made 20 league starts for the champions. The colossal centre-back chipped in with goals against Bayer Leverkusen and Eintracht Frankfurt, and even spent some time in defensive midfield. The 22-year-old said he became a better player under Jupp Heynckes last season, while Heynckes predicted he would become the "most sought-after central defender in Europe." Süle will be hoping to improve even more under new Bayern boss Niko Kovac. The promising 19-year-old is seen by many as the next German left-back to be coming through the system. He was thrown into the deep end for his first-team debut with Wolfsburg in a 2-2 draw at Bayern, going on to start four more matches in 2017/18 as the Wolves languished at the wrong end of the table. The recipient of the prestigious gold Fritz Walter Medal at U17 level in 2016, Itter has represented Germany at youth level from U15 through to U19 with appearances that reportedly attracted the interest of Arsenal, but Itter and his twin brother Davide-Jerome both turned the English club down to sign deals at Wolfsburg. Guess who conceded the fewest goals in the Bundesliga last season after champions Bayern Munich? Runners-up Schalke? Third-placed Hoffenheim? Nope. It was Stuttgart. That they let in just 36 all season as a newly-promoted side was in no small part thanks to Argentinian terrier Santiago Ascacibar. Signed from Estudiantes in his homeland in August 2017, the 21-year-old made an immediate impact at the Mercedes-Benz Arena and started 27 of his team's Bundesliga games. "He's very quick on his feet and his compactness and aggression make him a good player," said former Stuttgart coach Hannes Wolf of the 5'7" defensive shield. Sporting director Michael Reschke was equally taken with the South American: "He's like a machine that knits everything together out on the pitch. He wins an unbelievable amount of challenges and is a very tidy forward passer." Having made his debut on the final day of the 2016/17 season, McKennie pushed on in 2017/18 by registering 22 league appearances to help Schalke finish second in the standings. A composed central midfielder, McKennie also impressed in a series of end-of-season friendlies for the USA, and he is sure to be relishing the prospect of making his UEFA Champions League debut with the Royal Blues. As he heads into his fourth season with Dortmund’s first team, it’s easy to forget that Pulisic won’t turn 20 until September. The 2017/18 campaign was his busiest to date, as he scored four goals in 32 league games – 27 of which he started. Throw in DFB Cup, European and international fixtures, and the Pennsylvania native featured in close to 50 games in total. Pulisic has grown into one of his club and his country’s most important players, and he will be keen to help Dortmund improve on a fourth-place finish last time out. Havertz only turned 19 in June, but he already has over 50 Bundesliga games under his belt. It was during 2017/18 that he became the youngest player ever to reach that milestone, and he finished the campaign with three goals and a notable nine assists from midfield. A budding pianist off the pitch, the Germany U19 international is making sweet music on it. Havertz, though, is not one to rest on his laurels. Leverkusen earned a return to European football with a fifth-place finish last season, thanks in no small part to Bailey’s nine goals and six assists. The Jamaican struck three times in his side’s run to the DFB Cup semi-finals, and his career is seemingly developing at a pace akin to one of his devastating runs down the wing. Having taken six months to settle in following his move from Belgian side Genk in January 2017, Bailey lit up the Bundesliga last season. The challenge now is for him to soar even higher. Watch: Is Bailey the new Arjen Robben? Sargent moved to Bremen for the second half of the 17/18 season, but he was ineligible to play for the first team until now. The 18-year-old gave a glimpse of his potential in May, however, scoring in a 3-0 win over Bolivia during his senior debut for the USA. The Missouri native will now look to do likewise in Germany. Sargent admitted to being frustrated at not being able to get a chance in the Bundesliga until now, but Bremen manager Florian Kohfeldt has tipped him to “kick on” this year.